Business owners struggle with how to spend their IT budget. Ideally, money spent on technology should be helping to produce revenue and generate limited overhead. At Clearlink IT we have helped a number of companies create a successful balance. This is achieved by using their managed IT services collectively called Clearview. Our team remotely manages, protects, and supports your staff and customers. The managed IT service model is attractive to growing businesses. It has a pricing structure is based on a flat billing schedule and agreed service levels. This is contrast to the salaries, benefits, and overhead that comes with adding IT staff. This model also allows a business to allocate an assignment of some traditional IT risks. Clearlink IT assumes the responsibility for IT support operations based on a defined scope and length for the contracted service. Service level agreements are custom tailored to meet the IT needs of the business. Managed IT services can be a totally controlled environment, including network devices, servers, backups, telecommunications systems, and disaster recovery procedures. It can also be selective, focused on mission critical components such as servers and firewalls. It is the partnership between the business and Clearlink IT to develop a strategy that works best for the business. Clearview Managed IT services is a menu of IT options to support your business. It can deliver help desk support to staff and extend depth of service and skills to meet new needs. As a partner it can ensure business continuity / disaster recovery, and provide proactive care. This provides access to wider range of skills that you may not have from traditional in-house IT and faster resolution times. Clearlink IT works best in offices ranging from 5 to 500 network connected devices. It assumes an internet connection and access to information services that may be hosted internally, in a cloud environment, or a hybrid of both. It assumes that there is a phone system in place, which again can be internal, hosted, or a hybrid. There are variations on this structure and Clearlink IT is in a position to support them. How are Clearview Managed IT Services Provided? 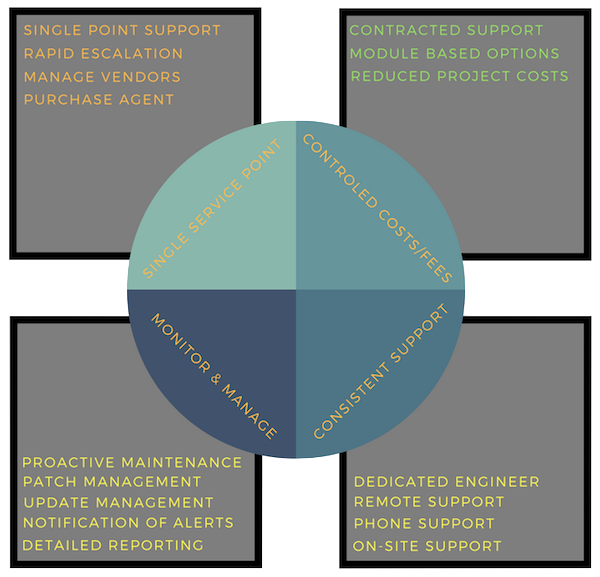 Managed services is a technology care package with various components. At its core it is the installation of small software agents on your network that provide detailed information on the health and performance of each device connected to it. The agent catalogs the hardware, the operating system and other applications installed and how long since they were updated. All this information is fed back to the Clearview management system. The engineers take this information to look for issues before they arise, reacts to alerts, installs patches to the OS and applications, and responds to staff questions. While Clearlink IT operates on a proactive/preventative level, sometimes things break or just seem to be running slowly or oddly. In cases like this, service can be requested at any time using phone, email, or by quickly submitting a ticket at http://clearlink.it/get-support/. All businesses have some IT support. Maybe its a staff member with a ‘knack’ for making apps work or it may be a full time dedicated IT staff person or three. Clearview managed IT services can provide a cost effective solution to complement and support what you have. Their engineers will provide access to the capabilities needed to keep businesses running in a smooth and secure manner. In the first scenario, you hired that person to fill a roll that was client facing and assisting in the generation of value to the client and revenue to the business. It became convenient to let the person moonlight as IT because the problems felt solved. This takes away from your business in two ways: Your clients lose some level of service or efficiency and you lose some revenue or staff time. More challenging in this scenario, is that the fixes are reactive ‘break and fix’ solutions. These have that band-aid feel that will pile up over time until a severe outage occurs. By then, it requires significant professional time to untangle and resolve. This is a typical scenario that Clearlink IT has seen in companies of various sizes. In the second scenario, you have hired an IT person to manage operations. (This is becoming a challenge as the number of IT skills needed to run a business can outstrip the most dedicated of IT professionals.) In this case, managed IT services is used, not to replace an IT person, but to provide a depth of service. This ensures that, in the event of your IT person leaving on vacation, illness, or for another job, you have a solution in place. Clearlink IT is also be a training resource for your IT person/team as new technologies are purchased for your business. Your IT team manages the implementation process and have access to the installation engineers to get the needed background. It provides your IT team with the skills to do diagnostic or maintenance work. They can always call the Clearlink IT engineers for a refresher or to confirm and correct a finding. Clearview Allows you to Pick and Choose What you Want Managed. Cloud based storage. This has become a default for storing backups. It must be configured, confirming its security and ability to provide access to backups in a cost and time effective manner. Recovery can be as small as a single file to an entire server backup and each can have a cost associated to it by the cloud provider. Secure Email Systems. In this age of gmail and Office365 Outlook it is easy to assume that these services are secure and capable of providing the filtering an organization needs. This is not always the case, nor are their spam filters entirely accurate. Clearlink IT can provide oversight on this service and can also blend in a low cost additional external spam and anti virus system that filters and scans email before it hits your email system or inbox and provide a complete report of what it has done and why. Hosted Applications – Whether you are using Google Apps, Office365 with Hosted Exchange, SaleseForce, or Voltage Secure Email, each has their unique licensing rules, costs, and their administrative requirements which can quickly get away from people not used to managing them. With Clearview we can manage your licenses at a competitive cost, deal with application access rights, and assign appropriate service levels to staff. Firewall / Perimeter Security Review– All internet connections come with some type of router that is touted as having an integrated firewall. What is left unstated is how good the firewall is, when it is updated, and its ability to manage traffic. Businesses may address this by adding an additional firewall. Clearview can provide a penetration test using a trusted third party to evaluate your firewall and any machine that can be accessed directly by the internet. This generates a report outlining issues and providing solutions on vulnerabilities discovered. Clearlint IT professionals can optimize the firewall ensuring only permitted traffic is allowed. Their maintenance process will monitor the firewall programming and firmware to ensure that they are current and capable of dealing with new threats. Clearlink IT provides firewalls that provides protection from threats, and controls access to websites to keep your team on task. Internal Network Infrastructure and Servers – Behind the firewall is the network infrastructure. This is often a collection of network switches, servers, and printers to which each device has some level of access. Clearview managed IT services monitors these components for operation and checks and updates firmware. For servers, Clearview provides comprehensive monitoring including a certified offsite backup solution. Backups are then restored to an existing machine, to a new machine, or as a virtual server inside in a cloud environment. Telecommunications Services & Phone Equipment – Clearview goes beyond a number of other similar managed services as Clearlink IT is a telecommunications equipment provider and a registered telecom service agent for all the carriers in Utah. Clearview provides complete VoIP phone system management and support. As a telecom agent they can businesses cut costs by evaluating the current bills and creating a competitive bid. Desktop Security, Management & Helpdesk – Clearlink IT’s Clearview service can provide complete management and help-desk functions to your PC users. PCs, Macs, and Linux desktops are monitored, confirming they are properly patched and running well. Clearlink IT engineers can create a shared session where the staff or IT observes the diagnostic or repair process. Their engineers can walk through features that staff may have a question on. Clearview can provide a managed antivirus and anti-malware service that will protect the computers and servers on your network. They can then quickly send out updates and provide reports on quarantined threats. If you are interested in learning more about how managed IT services can remove the distractions and uncertainty surrounding your IT support and technology budget, please call us and we will be glad to work through your options and get started on a competitive solution. 387 E. 200 N. Bountiful Ut.